San Francisco: A Food Biography is best read on a full stomach. If you do not follow this advice, the appealing descriptions of San Francisco cuisine and restaurants will cause you to go out and eat something, perhaps a sandwich on sourdough bread, a seafood dish or a burrito inspired by the Mission burritos made in San Francisco in the 1960’s and 70’s. This well-written, comprehensive and well-organized book is the second in the Big City Food Biographies Series, edited by Ken Albala and published by Rowman and Littlefield. The first book in this series is Elizabeth Williams’ New Orleans: A Food Biography. The publisher has just released New York: A Food Biography and has a Boston food biography in the works. Although this book may be the first time many have heard of Erica Peters, she is well suited to write about San Francisco food. This is her second book, her first is Appetites and Aspirations in Vietnam and she is a director and cofounder of the Culinary Historians of NorthernCalifornia. Peters is an excellent writer. She lets the material tell the story. She provides the narrative, sets the pace with strong structure and then lets the people she met in her research tell the story: celebrities such Mark Twain and Trader Vic or less familiar people such as Abby Fisher, an African American woman who was renowned for her southern cooking and wrote one of the first modern cookbooks in the region. Peters has a formidable talent for organizing material. She covers the history of food in the region from its earliest settlement up to the present day. To do this, she immersed herself in anthropological and archaeological research, cookbooks, many hundreds of newspaper articles, biographies and histories of every aspect of the economy, society and ecology of the City on the Bay. San Francisco: A Food Biography has a topical format, opening with a chapter on how Bay Area climate and ecology influences cuisine. The next two chapters explore Native American cooking and how ethnic groups in the City - - Spanish, African Americans, Chinese, Japanese, Italians and others - - arrived and adapted their home cuisines. 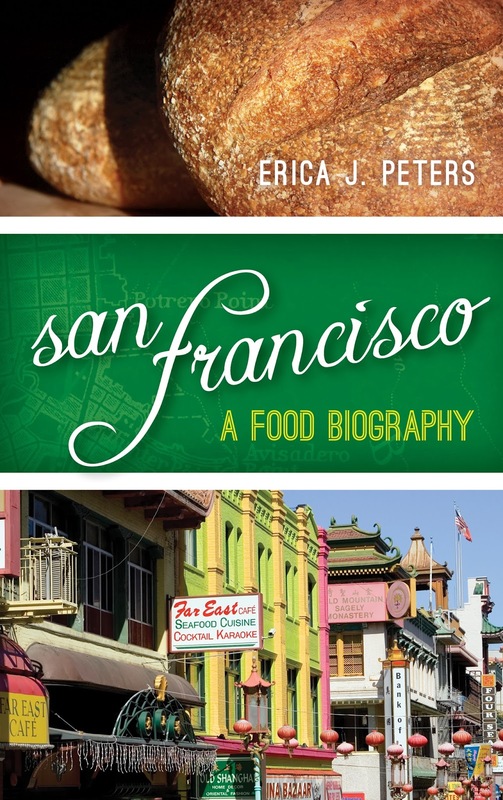 From here, Peters offers chapters on: food markets and retailing; famous restaurants: San Francisco cookbooks; and signature dishes, those recipes which people think of most when they think of San Francisco. Americans take it for granted that fresh produce appears in markets every day of the year. Peters suggests San Francisco was one of the first places in America where people realized California agriculture could supply fresh and nutritious food year ‘round. This realization occurred around the time of the Gold Rush in 1849 and would have been a great relief to residents and miners who had to live on bland and doughy foods. Peters reports on her subject in a balanced manner. For example, she discusses the racism and exclusion that nearly every ethnic group faced, when arriving with new foods. But she also shows how the racism was overcome and local society has moved forward. I have been lucky to visit San Francisco and eat in some of the restaurants that Peters describes. From personal experience, her restaurant and food descriptions are exactly right. When she describes the City’s signature dishes, it took me back to great meals in San Francisco restaurants and homes, meals enjoyed with long-time friends and family.